Last weekend I found myself with spare sewing time because I had to put my book step-outs on hold. 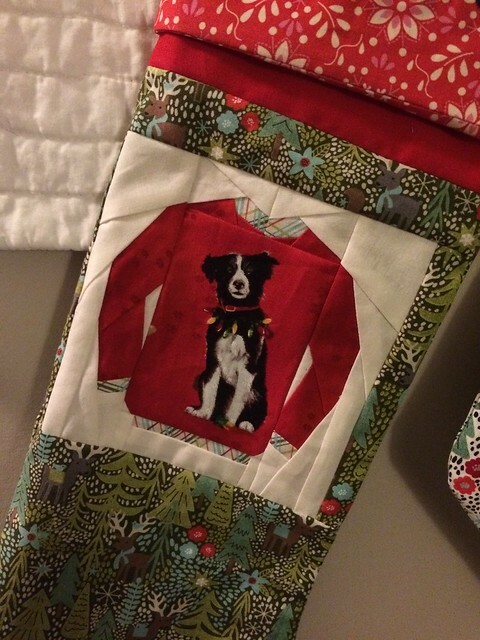 But that aside for a moment, it meant I made these ugly sweater blocks (pattern by Kid Giddy) with some silly dog-themed Christmas fabric I knew they had at My Sewing Room. 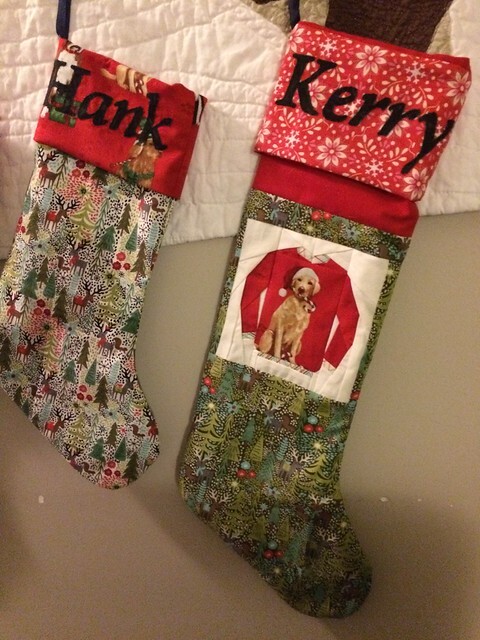 And they became two stockings for Christmas. The names were cut out with my Scan N Cut, of course. The fabrics are a mismatch I know, but I really liked this Juniper Berry collection by Basic Grey and planned to use it for stockings well before I made the sweater blocks. 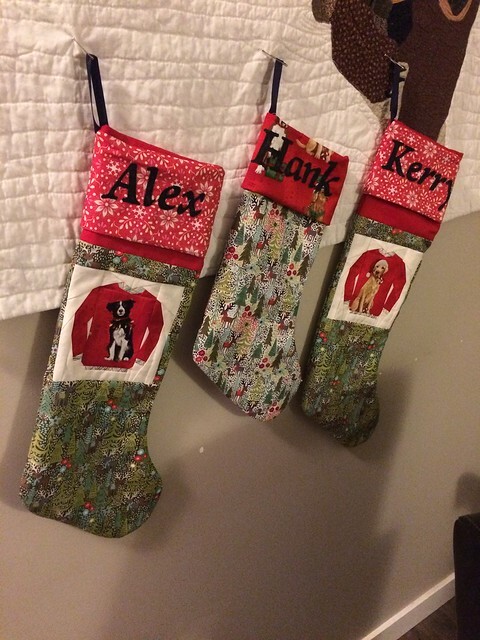 Stocking pattern is free, and by Sew Like My Mom. And I made the human ones a touch longer. So back onto the pause in book stuff. My book will not be out November 2017 now, it will be February 2018 we think. This is because I’m remaking some of the project or tweaking them as requested by the publisher. Some of the designs were too abstract for the concept and they feel it would tie everything together better. It’s a little bit worrying since I worked part time whilst getting through the bulk of it earlier in the year and I have less time available now, plus it feels like a bit of a waste of time and fabric, but I’m going to lick my wounds, get my head down and just get on with it as quickly as I can and try to enjoy the process. 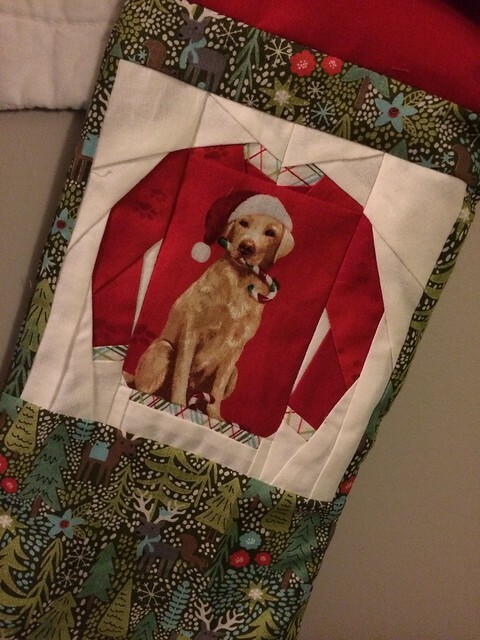 Your stockings and sweaters are cute and it does seem that you are a dog lady for sure. The book stuff is a setback but then again, just enjoy the process. There are others who might be able to assist with sewing or quilting if that were to make any sense?